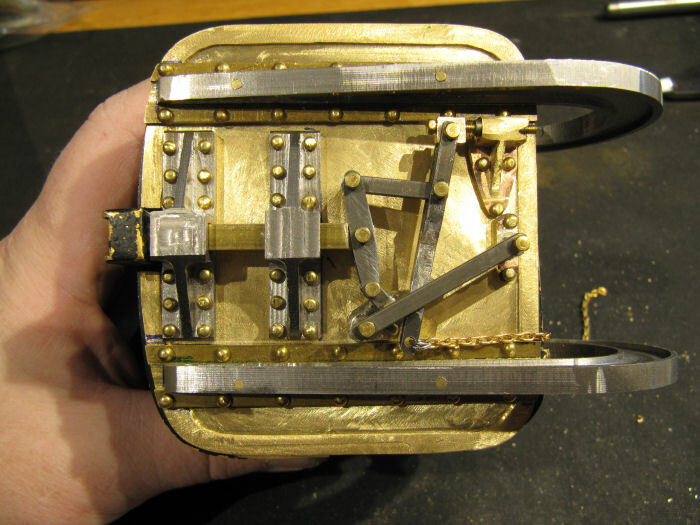 More work on the bucket door latch mechanism. For the base that the short link and the retaining link bolt into, I drilled/tapped a couple short bits of round rod on the lathe, cut them to length, and silver soldered them into holes in some brass plate - left the plate large to give something to hold onto. and riveted it in place on the door. With this in place, the short link proved its worth (thanks again for spotting it guys! ), and the latch is moving properly. 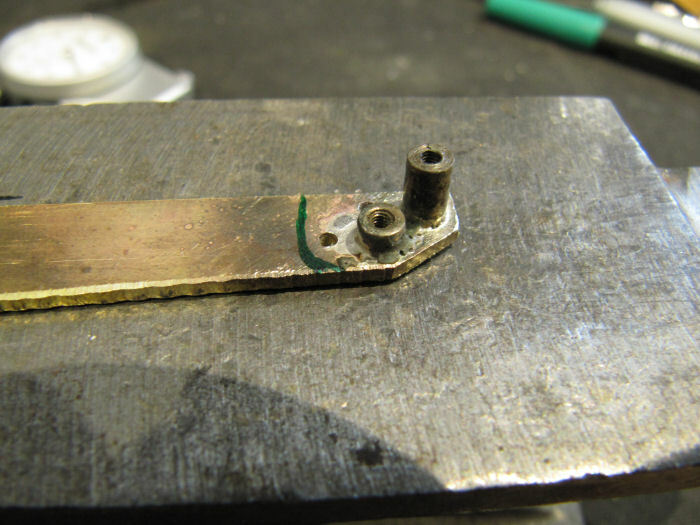 Then on to the adjusting bracket, which will hold a threaded rod that the yoke link anchors to. 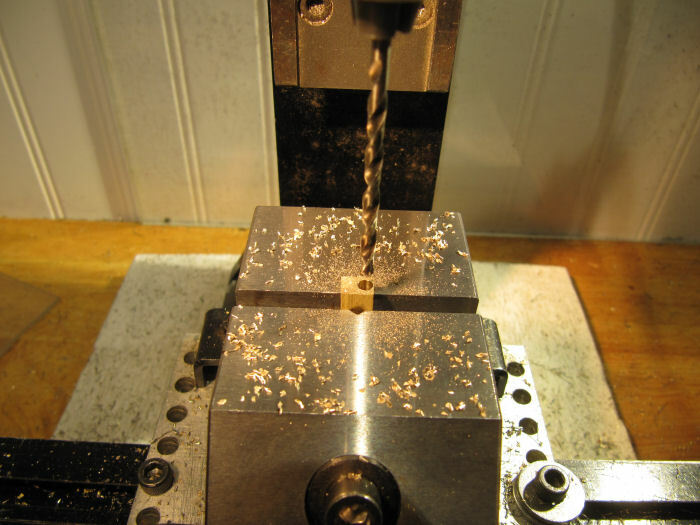 The upright was cut/drilled from some brass, with a hollw threaded steel rod down the center. 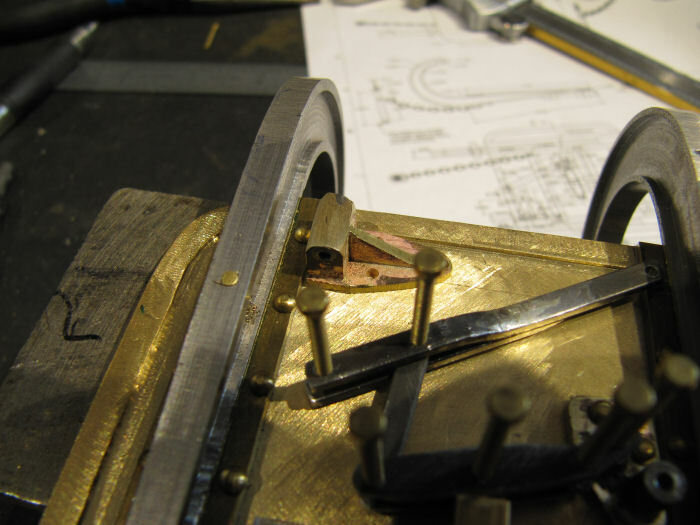 That block was screwed to a brass plate, and another plate cut and clamped to it to form the angled brace. The parts were then all silver soldered together. 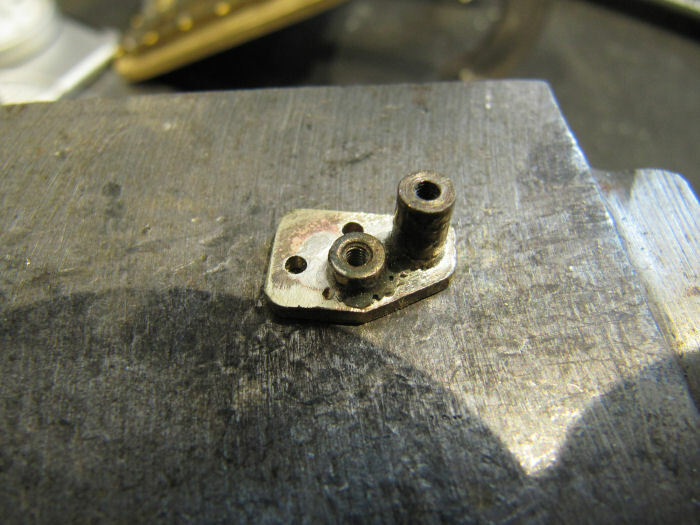 The notch in the angle plate is to clear the rivet hole at the end of the bracket. Here is the bracket all trimmed down and filed to shape, set in place on the door. Last bracket is to hold the other end of the retaining bar. Here it all is assembled onto the door. Still need to make the retaining bar and the threaded rod for the yoke. One thing I realized when moving the links around to test it, was that the retaining bar and its rear post do two things - keeps the link under it from rotating down too far, and also acts as a limit stop so the chain cannot be pulled too far and pull the latch completely out of the guides. Now it makes more sense why they had that retaining bar. Once those last parts are made, I'll try and do some pics and/or video to show the motion of it. There is already enough there to see that it auto-latches the door when the bucket is tipped down! Oh, and to confirm the measurements from the drawings a week or so ago - the linkage so far has a reduction in motion from the end of the final link (where the chain will attach) to the latch bar itself of 6 to 1. The lever on the boom that the chain runs to will add another 3 to 1 reduction, so the final levarage will be 18 to 1 in how far the operator has to pull the rope to the movement of the latch bar. Amazing progress on your bucket latch system there, Chris. 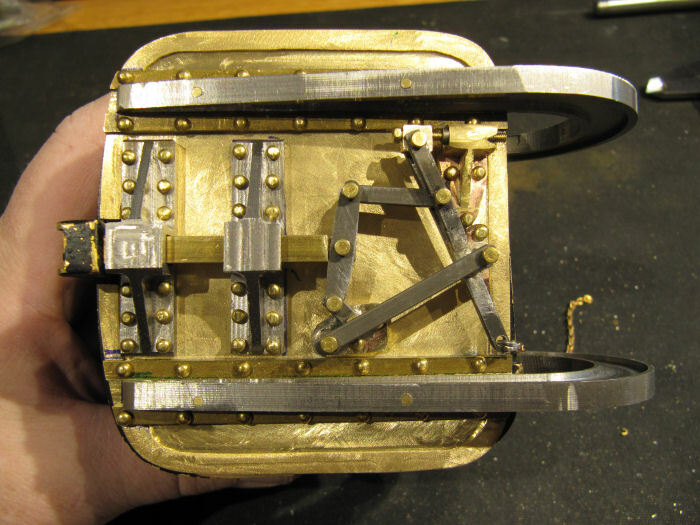 And I love the turtle mechanism too, very clever! I'm glad my tiny contribution was useful but bad news about that BIG box of snow you sent as a thank you gift . . . it must have melted in transit so we just got rain. Now, if I can just find your secret for slowing down time I might get some workshop time of my own . . . Doesn't need it - that cross lever is wider in the center, tapers to each end, which is enough to handle the small angle it pivots. If that lever were parallel sided, the it would need the relief you describe, but Marion took that into account, I have copied their shape. It doesn't show in the pics, but there is about a 8 or 10 degree angle to each side. That release mechanism in an interesting design. I wonder how much of the design was engineering and how much was.......once the pin was in place............them just adding livers, pivots, and brackets until an operator pulling on a rope could release the pin. By that time the basic steam shovel design had been around for about 50 years, so I'm sure a lot of things got fine tuned, tweaked, and changed! Got the last couple of parts on the bucket door made today, the retaining bar and the adjusting rod. 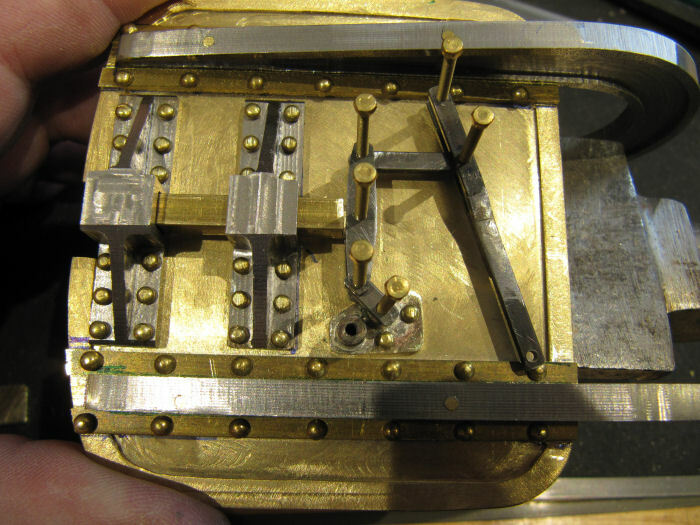 Here are a couple of photos - first shows the linkage in the 'latched' position. 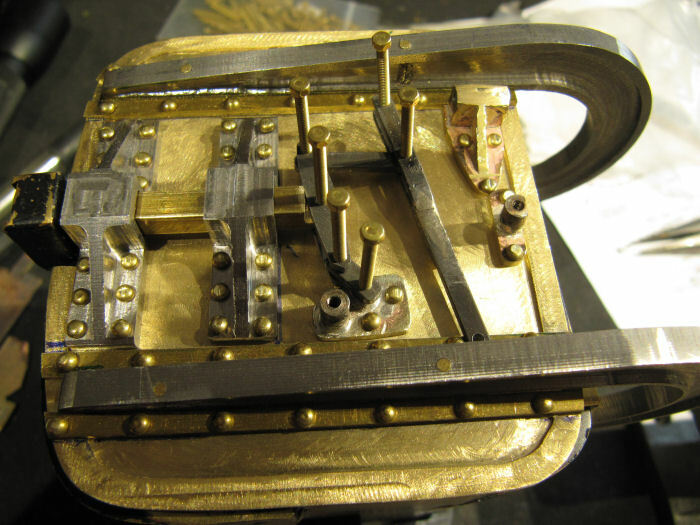 and here it is in the 'unlatched' position, after the chain has been pulled and the latch bar retracted. As you can see, the chain end of the final bar moves a lot, the latch bar just a little. 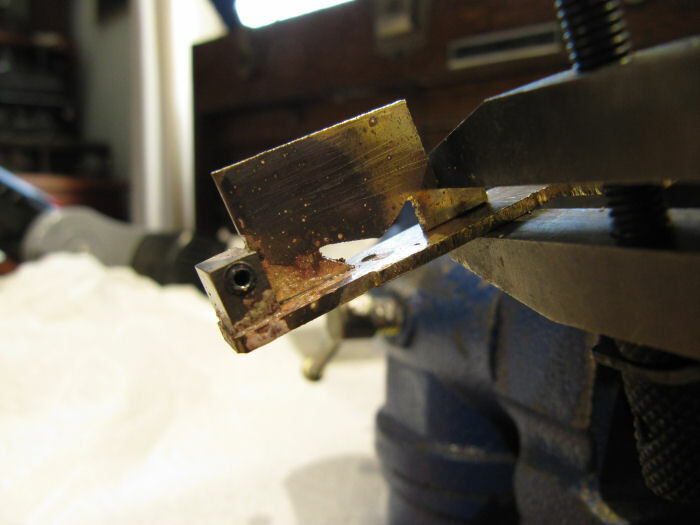 The short link we discussed does not move a lot, but it does swing and keep the latch bar from jamming in its guides. I'm definitely going to have to go light on the paint on these parts, to keep them from sticking! So the latch closes via its own weight? That's right, they used gravity for everything possible, there are no springs anywhere. Even the return on brake lever, etc is by counterweights. On the real thing, that latch bar must weigh quite a lt, on the model best I can do is hope the brass is heavy enough, though I could always sneak in a tiny spring if its not reliable. Thanks Achim, I am quite pleased with how it is going.